‘Deo gracias Anglia!’ or the ‘Agincourt Carol’. The Trinity Carol Roll (MS O.3.58), a parchment scroll over six feet long, is the earliest source for English polyphonic carols. 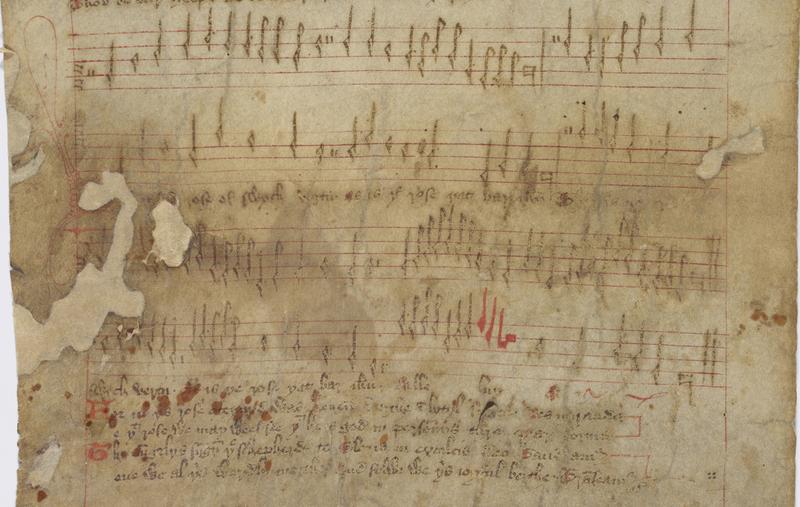 Dating from the early 15th century in East Anglia, the roll contains words and musical notation on a five line stave for thirteen carols in Middle English and Latin. 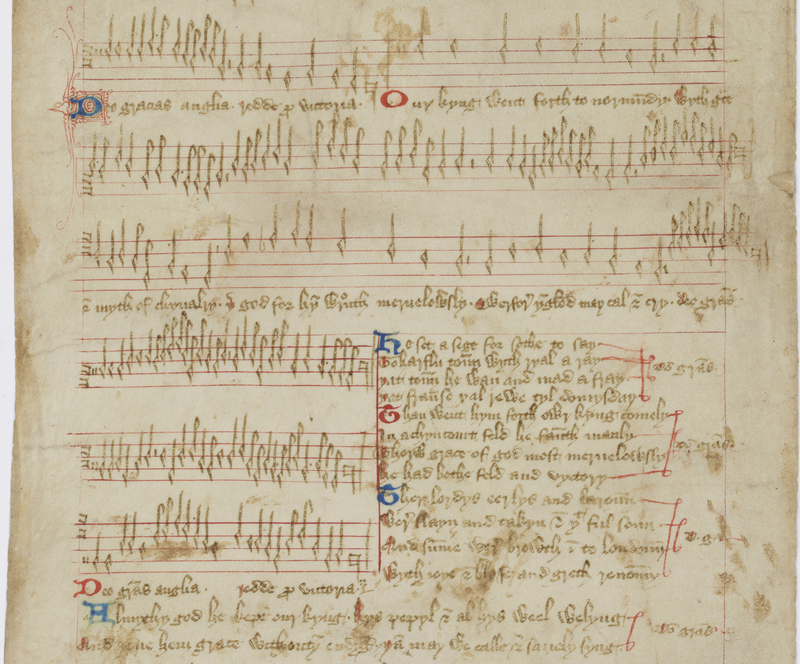 These include the patriotic ‘Deo gracias Anglia!‘, also known as the ‘Agincourt Carol’, celebrating Henry V’s victory over the French in 1415, and the popular ‘Ther is no rose’, which was later arranged by Benjamin Britten for his Ceremony of Carols in 1942. Not all of the carols are intended to be sung at Christmas. A carol in the Middle Ages was a festive song sung at any time of year, often religious in theme but not a part of church worship. They were often the accompaniment to circle dances, processions or Mystery Plays. Carols in general saw a decline after the Protestant Reformation, but Christmas Carols have remained popular and some are among the oldest music still performed regularly. And wone wyth us perpetuel. 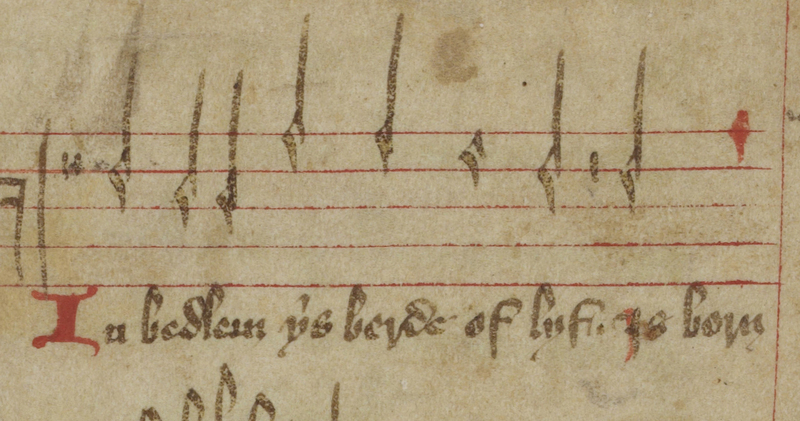 You can listen to a recording of the Trinity College Choir singing ‘Ther is no rose’ (arr. John Stevens) as a part of their Advent Carol Service on 30 November, 2014 on the Choir webpage. The entire Carol Roll was also recorded by the early music consort Alamire. Their album, Deo Gracias Anglia!, was recorded in the Wren Library in 2011. ‘Ther is no rose’, the final carol on the Trinity Carol Roll. Is there a transcription into a score in present day notation of the trinity carol roll ? Music from the entire carol roll was performed and recorded by Alamire in 2011 in the Wren Library. Their CD notes comment that it was unlikely that the roll itself was used in performance, providing instead a notated record of the tunes and text. Alamire prepared a new performing edition of the roll especially for the recording (http://alamire.co.uk/).